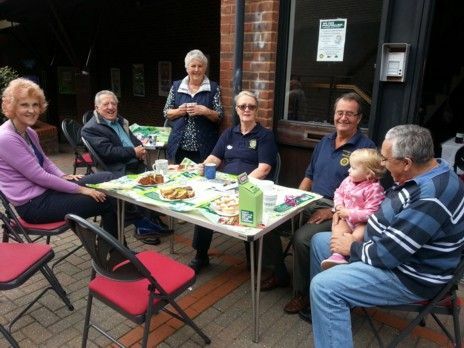 The Rotary Club of Cranleigh held a coffee morning in aid of MacMillan Cancer Care on Friday, 30 September at Sycamore House, Cranleigh from 10 am to midday. Rotarian Jane O'Leary reported: "The weather was perfect and we set up outside to take advantage of the sun. We were very busy all morning after the Rotary ladies dropped off their contributions ranging from milk chocolate brownies to Cornish sticky cake and cappuccino cup cakes, from lemon drizzle to Bakewell tarts. An absolutely brilliant array of goodies which were tucked into by a vast number of willing 'customers'. What was left was parcelled up at the end of the morning and transported back to Oakwood. "In the afternoon, supplemented with more donations of chocolate cake, the estate of Smithbrook Barns tucked into coffee and cake. At the end of the event, leftovers were again gathered and distributed to the Methodist and the Baptist churches who polished off the remainder. "We even sold pots of jam, house plants, and held a raffle for a superb cake that Janet Poll from Oakwood made along with other items. "The event in the morning raised £358.00, the afternoon £191.95, the Methodists £36.50 and the Baptist contribution of £38.55 - a grand total of £625.00. "Thanks must go to the ladies and the Rotarians who turned out to wash up, serve, generally help out and staff the membership table as well."